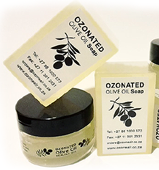 Ozonated Olive Oil comes in Two Distinct Products: Ozonated Olive Oil Castile Soap & Ozone Olive Oil Healing Gel. Ozonated Olive Oil Soap (Castile Soap) may be used on the Skin and Hair during your Daily Bathing & Cleansing Routine, or for the Treatment of different kinds of Skin Problems or Skin Disorders. 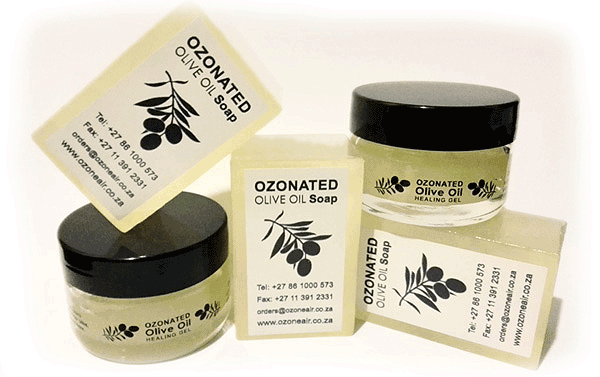 Ozonated Olive Oil Soap Bars for Face & Body - R30.00 per Bar (Buy 4 & get 1 Free) - Call to Order Now on 011.391.2331 OR Send an eMail! A great benefit of using Olive Oil Castile Soap is that it does not dry out the skin! The general complaint about ordinary soaps is that they clean the skin very well, yet, at the same time, they dry the skin out. Ozone is now been introduced into the Olive Oil through a special process. This causes the Olive Soap to cleanse & disinfect the skin effectively whilst maintaining softness and suppleness. Another wonderful benefit is the Anti-aging effect, especially on the face and neck. Contact an OzoneAir Representative for more Information & Orders.